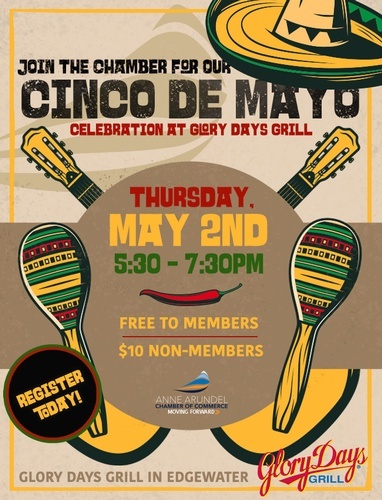 Networking, Great food, Cash bar with specials for Cinco de Mayo - come see our members/ambassadors have a sombrero dancing contest!! A must see!! Promote positive change in the community while helping your business grow. Stay connected and informed through upcoming Chamber events. Explore benefits and resources available to Chamber members only. Receive important updates, announcements, events and promotions right to your inbox! Copyright ©2019 Anne Arundel County Chamber or Commerce, Inc. All Rights Reserved. Powered by Liquified Creative.